In this blog we shall learn how to work with Azure File Storage using Azure Storage Client Library for .NET and Visual Studio 2017 with C# as programming language. For novice Cloud developers, aspiring Cloud architects and all other IT professionals associated with Cloud computing, especially with Microsoft Azure, this blog will explain the importance and capabilities of Microsoft Azure File Storage. Secure managed File share on Cloud. Quick access to files with high latency, low bandwidth links via smart caching. No complex management of deployment hardware or operating system for File shares deployment. Makes Cloud migration possible for file share dependent applications with no breaking change in code. Support Azure File share mount from Windows & Linux. For brevity of this blog, we have created Microsoft Azure Storage account using Microsoft Azure portal. Navigate to Storage Account => Overview section. Navigate to Access keys section. Copy Storage account name and key (any one). We shall require this details in order to get connected with Azure storage account in our application. Create a new ASP.NET console application. Give any name to application, here we shall name it as ‘LeaningAzureFiles’. Go to Solution Explorer => Right click on Project => Click, Manage NuGet Packages. With Include prerelease box as checked. Select the very first listed library, as shown in below image. WindowsAzure.Storage: Client library for working with Microsoft Azure storage services including blobs, files, table and queues. Once library is installed, we can notice an addition of new libraries in our project reference folder. AzurestorageAccountName (Variable with any name can be declared): Storage account name. Paste name we copied from Azure portal as storage name. AzureStorageAccountKey (Variable with any name can be declared): Keys for accessing Azure storage account. Paste any one key among being provided in Azure portal. Using above values or details, we shall create connection with our Azure Storage from application. CloudStorageAccount represents Microsoft Azure Storage Account. This class is from Microsoft.WindowsAzure.Storage namespace. It initializes Azure storage account instance. Storage Credentials: Initializes new instance of CloudStorageAccount using Storage account name and key as credentials. Boolean value: Specifying whether to use HTTP or HTTPS to connect to the storage services endpoints. ‘True’ to connect using HTTPS, otherwise ‘False’. For this blog we shall provide it as ‘True’. Place a debugger in code. Connection with Azure Storage account is created and endpoints details for Storage Files can be seen. We need to create an Azure File service client using CloudStorageAccount instance. CreateCloudFileClient(): Creates the File service Client. GetShareReference(): This gets the reference of File share provided.. It accepts name (filesharename) as parameter. For this blog, we are creating ‘learning-file-share’ file share. CreateIfNotExists(): If not already exist, this would create the file share with name provided. Refer below image, for above mentioned implementation. Click on Files, under Services block, as shown in below image. 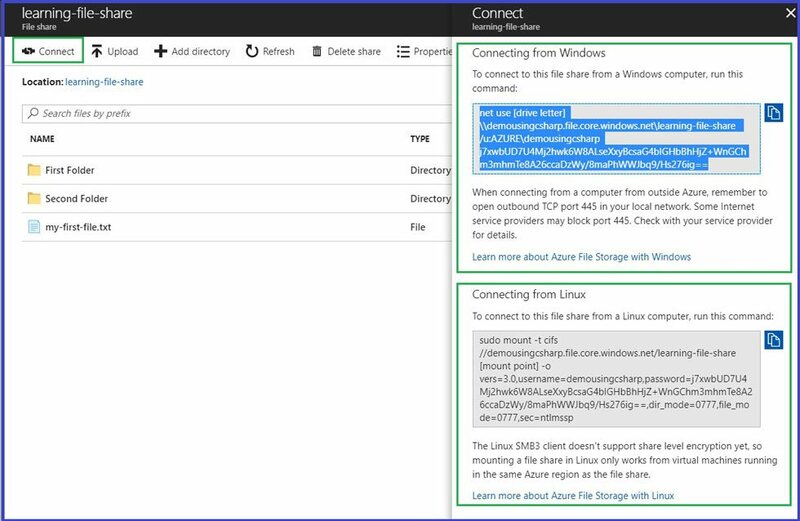 We can see newly created Azure File share naming ‘learning-file-share’ , along with its URL or endpoint to get connected. GetRootDirectoryReference: Retrieves information of root directory in given File share. GetFileReference: This gets the reference for File in given File share. It accepts name (filename) as parameter. For this blog, we are creating ‘my-first-file.txt’ file. Great! new file is now created. As we have used UploadText method to upload text string in newly created file, let open up the file to verify it once. Blade with name File properties will appear at right corner of portal screen. Download – To Download respective file. Delete – To delete respective file. Once the file gets downloaded, open the file. We can see the string text we passed in UploadText method, is part of our file. GetDirectoryReference: Creates & retrieves folder information at given root directory in given File share. CreateIfNotExists(): If not already exist, this would create the folder with name provided. Click on Files => learning-file-share (File share created). We can see newly created folder at File share root. Now, create file with some text under this given folder. Repeat above mentioned steps for creating a file. The only change here would be, now its not on root directory but in folder. Refer below image for detailed implementation. In similar fashion we can create multiple files, folders in Azure File share. Let’s repeat the same activity for creating folder & file in folder. Run application & verify in Azure Portal. Newly created file inside Folder. Azure storage allows mounting of Azure File Share in to our Windows & Linux machine. When connecting from a computer from outside Azure, remember to open outbound TCP port 445 in your local network. Some Internet service providers may block port 445. Check with your service provider for details. It gets connect with running anyone from PowerShell commands & commands. These commands are already provided in Azure portal. Just copy & Run! The Linux SMB3 client doesn't support share level encryption yet, so mounting a file share in Linux only works from virtual machines running in the same Azure region as the file share. Refer below image for the commands. As an exercise, will recommend to try this of your own with reading the links provided. This will help you in understanding the concept in much better manner. Write a method for downloading all folders & files from File Share. This method accepts File Share Root directory object & Location of machine where we need to download this file. ListFilesAndDirectories – This will list down all the details of Files & Folders for given File share. CloudFile – If the content in list from above method is a file, item will be associated with CloudFile family. 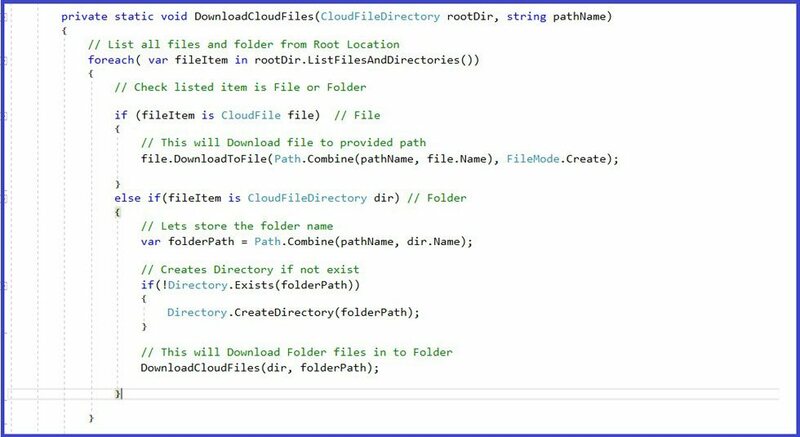 CloudFileDirectory - If the content in list from above method is a folder, item will be associated with CloudFileDirectory family. Using above entities, method will check files & folders from given Fil Share root directory and accordingly download the files at provided location. Below image shows the above implementation with step by steps details as comments. Calling above Method with passing required parameters as mentioned above. Compile & Run the application. All the above created files & folders are downloaded at provided location. Open the file to verify the content. Great folders, files & content are verified! 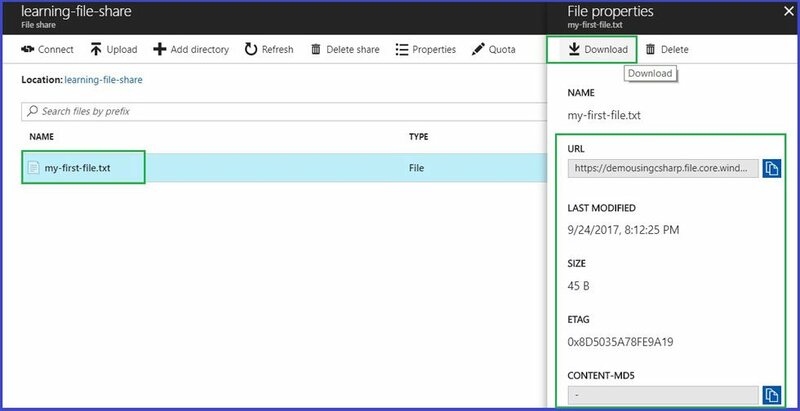 In this blog we learned how to get connect with Azure Storage account, create new Azure Storage File share along with adding folders & files in to Azure file share. Also, how to mount & download file share contents all in ASP.NET application using C# as programming language. Hope this blog will help developers to easily get started with Azure File share using C#. Would recommend to try working with Azure Files, to leverage azure storage power in to your application. Chirag Tumar, A 5-years experienced developer in Nexsoftsys, has vast knowledge about content writing. Nexsoftsys is an Offshore ASP.NET development Company India. Chirag wrote many technical content from his experience. Thank You!